Posted by Linda M. on September 10, 2016 at 8:49pm in Who Am I? It is one of my favorite shows....we now have all the seasons. They took a big risk doing this show, and though I love watching it, it still amazes me, they let it go on for 6 years. 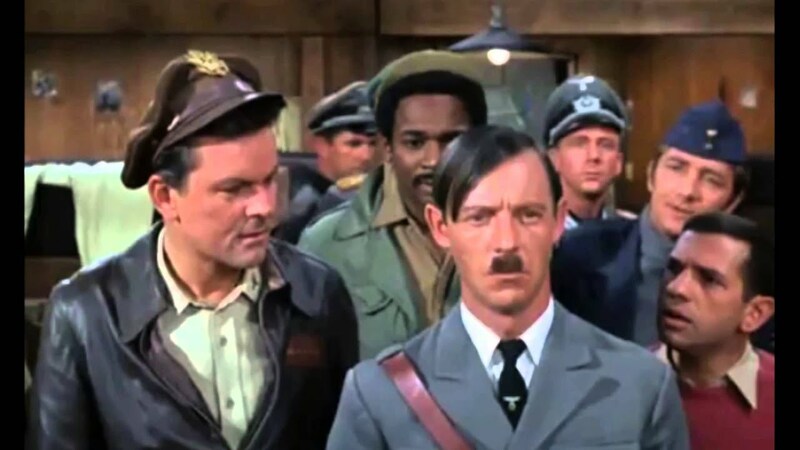 There has never been a show quite like Hogan's Heroes. 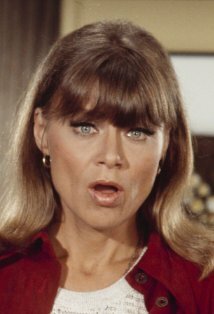 (Well, perhaps F Troop.) The CBS sitcom mined a hard and heavy period of history for its humor, as it chronicled the exploits of a cunning group of Allied soldiers in a Nazi POW camp. The quick wits and charisma of the good guys played by Bob Crane and Richard Dawson, not to mention the brilliant bumbling of Werner Klemperer and John Banner, played a large part in the series' success. 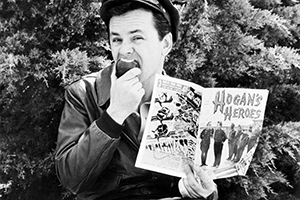 Hogan's Heroes launched in September 1965 and became a top ten show in its first season, running for five more years. 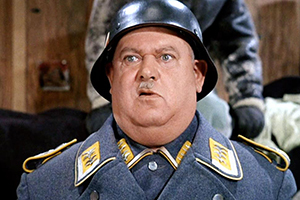 Through its six-year life span, the comedy garnered 12 Emmy nominations, winning two for Klemperer's portrayal of Colonel Klink. The premise, the scenarios and the cast make it one of the more endlessly fascinating shows of the 1960s, both onscreen and off. THE ORIGINAL SCRIPT HAD THE SHOW SET IN AN AMERICAN JAIL. Series co-creator Albert S. Ruddy first set Hogan and his heroes in a domestic clink. He rewrote the script upon learning that NBC was developing a show titled Campo 44, which would be set in an Italian WWII prison camp. 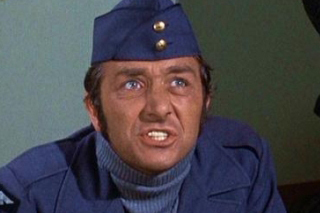 In an interview that appears on the Hogan's Heroes complete series DVD set, Ruddy claims that it took him just a day to rework the show into its WWII setting. Three years ago, Ruddy and Bernard Fein won the rights to the show back from billionaire basketball owner Mark Cuban. STALAG 13 INITIALLY HAD AN UNDERGROUND STEAM ROOM. With its network of tunnels and trap doors, Stalag 13 was certainly far-fetched. At first, it was even more fantastical. The prisoners had an underground steam room. It was removed for being deemed too outlandish. RICHARD DAWSON WANTED HIS CHARACTER TO HAVE A LIVERPOOL ACCENT. The rakish British star originally auditioned for Hogan, but could not pull off a convincing enough American accent. Instead, he was cast as Cpl. Newkirk of the RAF. Dawson at first performed the role with a Liverpudlian accent, but was told by the network that nobody could understand him. Dawson switched to a Cockney dialect. When Beatlemania exploded in the States, Dawson jokingly told his bosses, "I told you so." 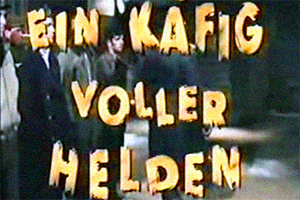 THE ACTORS PLAYING THE FOUR MAIN GERMAN ROLES WERE JEWISH. Klemperer (Klink), Banner (Schultz), Leon Askin (Burkhalter) and Howard Caine (Hochstetter) were Jewish, and all but the latter had fled the Nazis during WWII. Additionally, Robert Clary, who played the cooking French corporal, LeBeau, had been interned at a concentration camp. Klemperer stated at the time, "I am an actor. If I can play Richard III, I can play a Nazi." The actor insisted that Hogan always won out over his captors. 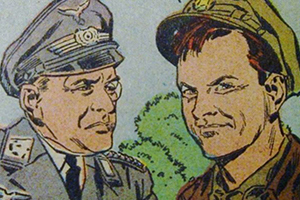 THE SHOW USED THE TAGLINE "IF YOU LIKED WORLD WAR II, YOU'LL LOVE 'HOGAN'S HEROES'!" The tagline was sarcastically suggested by comedian and author Stan Freberg in an interview with Bob Crane in The Sunday Times, on September 15, 1965. "Shall we say, 'If you liked World War II...you'll love Hogan's Heroes?'" Freberg dryly asks. "No, let's not say that, no," Crane responds. Nevertheless, it became the tagline. 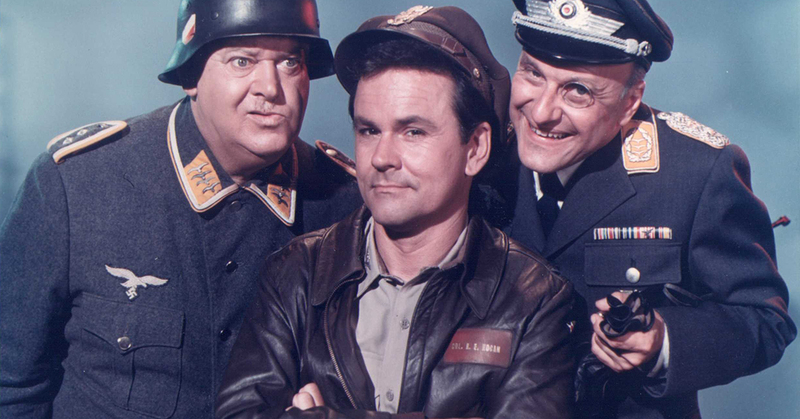 A 'HOGAN'S HEROES' ALBUM WAS RELEASED FEATURING CAST MEMBERS SINGING SONGS FROM WWII. 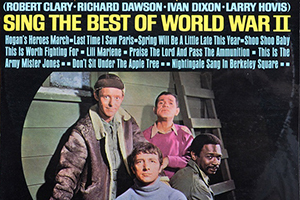 Clary, Dawson and costars Larry Hovis (Carter) and Ivan Dixon (Kinchloe) — pictured on the album cover — used the success of the series to showcase their singing talents. The four sang popular songs of the 1940s on this tie-in album. The liner notes on the back begin, "Would you believe World War II was funny?" THE THEME SONG ACTUALLY HAD LYRICS. The chirpy instrumental march that opened and closed each episode had secret lyrics. Robert Clary, Richard Dawson, Ivan Dixon and Larry Hovis formed a quartet of singing Heroes for the show's soundtrack. Sons of all the heroes of the war before. That's what we're heroes for. Check out all four verses here. THE MERCEDES TOURING CAR USED ON THE SHOW WAS ONE OF THREE IN EXISTENCE. 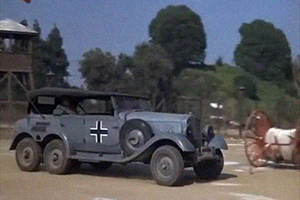 General Burkalter, Klink's boss, would wheel up to the camp in the stylish Mercedes-Benz W31. Only 57 of the black and gray convertibles were constructed, and just three remained after the war — one belonged to the Spanish monarchy, another became a fire engine, and the last ended up in Hollywood. KLINK WAS ACTUALLY A TRAINED VIOLINIST. 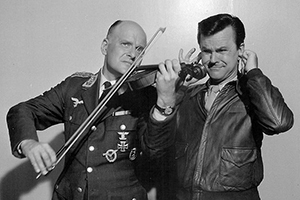 A recurring gag on the show was that Klink was a terrible violinist. In real life, Klemperer was quite accomplished on the instrument and the piano, as his father, Otto Klemperer, was one of the key conductors in 20th-century German classical music. What an ignominious fate. 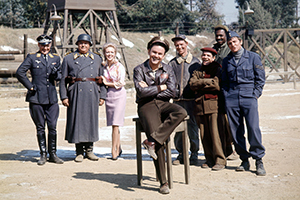 Hogan's Heroes was filmed on Desilu Productions' RKO Forty Acres backlot. 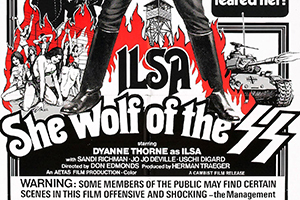 In the making of the trashy 1974 exploitation film Ilsa, She Wolf of the SS, the set was destroyed for the final scene. 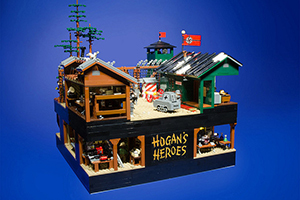 Hogan's producers were okay with it, as it saved the cost of having the set demolished. Crane, Klemperer, Banner and Askin teamed up for this big-screen rom-com about an East Germany pole vaulter. In his Kill Bill: Volume 2, Quentin Tarantino (undoubtedly a fan of Ilsa, She Wolf of the SS) has Uma Thurman buried alive in a grave marked Paula Schultz. Hogan tries to influence visiting Italian Major Bonacelli (Hans Conried) into helping him. 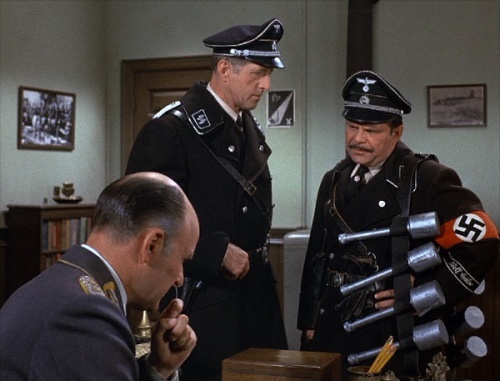 Major Hochstetter (Howard Caine) with a whole load of fake Model 24 Stielhandgranaten in "The Big Broadcast" (Season 6, Episode 12).